The parents of a 23-month-old boy who has been at the centre of a life-support treatment battle are preparing to return to court. 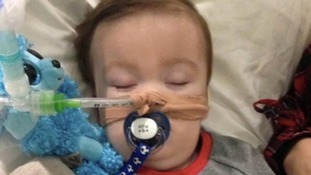 The parents of a seriously ill toddler from Liverpool are in a High Court fight for their son to continue to get life support treatment. Two Greater Manchester councils will go to the High Court today to try and restrict how Ian Brady's remains can be disposed of. “As part of the court hearing, there has been overwhelming unanimous medical opinion among our own medical consultants and independent clinical experts that it would not be in the patient’s best interest to intervene and be resuscitated again. We believe he will suffer more pain and sustain further damage to his brain. “This has been a very difficult and emotional time for Mr L’s family who have shown great dignity throughout this difficult process. We appreciate the family wish to do everything they can in the best interest of their loved one." "The family are devastated at the outcome of the hearing and remain of the view that all attempts should be made to prolong L's life, particularly in view of his uncertain prognosis. "They consider that it was inappropriate to place a Do Not Resuscitate order in L's notes without informing or consulting his family and that, in view of the uncertainty in relation to his condition, it was premature to do so." A High Court judge has allowed a hospital trust's request to withhold life-saving treatment from a severely brain-damaged Muslim patient from Greater Manchester if his condition seriously deteriorates.